Obviously you are daily brush your teeth and may be use a mouthwash weekly. But still your smile looking yellowish. Some chemical teeth cleaning products may damage your teeth enamel and gums. Consumption of more tea, coffee, cigarettes and beverages are other causes of yellow and pale teeth. Try to use more and more Vitamin C, D and E in your daily meals for the inner health of your teeth bone. If you want a whiter smile like pearls, natural teeth whitening home remedies can change your appearance into a beautiful smile. Dry up Raw Walnut Peel Off in sun for 4-5 days. Make a powder of this dried peel off. Daily take 3-4 pinch of this powder and brush your teeth with it. Within 6-7 days you will get whiter teeth and strong gums financially. Daily rubbing with Neem tooth brush tree (Miswak) as toothbrush will keep your teeth whiter and whiter. Also remove plaque and tartar from your teeth permanently. Mix in equal quantity Strawberry and Lemon Juice and rub with your finger on the teeth for 5 minutes and leave it for 5 minutes then brush softly. Then rinse with normal water. Very much effective remedy for whiter teeth. The sweet tasting bright colored strawberries can brighten up your smile as well. All you have to do is take one to two strawberries, mash them up and apply them to your teeth for 2 to 3 minutes. After this procedure you can simply rinse off with water or you can brush your teeth. Strawberries help in two ways. Firstly, they are a rich source of natural enzyme known as malic acid. Louisa Mccan-Graves, beauty expert and author of the book, “Hollywood Beauty Secrets: Remedies to the Rescue”, says that malic acid is the key component in many teeth whitening toothpastes. Dentistry expert, Dr. Steven Roth says that the fiber found in strawberries act as a natural cleanser and helps remove bacteria, specifically from the mouth and teeth. Make powder with dried Oak tree skin and add Salt in equal quantity. Daily brush with it before brush add 3-4 drops of Lemon Juice in the powder. Continues use of this useful remedy will make your teeth like pearls. Banana is a fruit with many essential nutrients for the body. Who says banana peels are a waste? Next time when you are about to throw those banana peel rub them on your teeth for two minutes. After 15 minutes, brush your teeth with your regular toothpaste. Repeat this process twice or thrice a week. After some time you will notice a visible difference. How can banana peel help to whiten teeth? Banana peel contains some essential mineral like potassium, manganese and magnesium that penetrates into the teeth and helps to whiten them. Mix Cloves powder or Clove Oil, table salt in equal quantity and mix 2-3 drops of Olive Oil daily when you use it. Eugenol in Cloves is a natural antiseptic which relieve toothaches and healthy for teeth, gums health. Make a mixture of Clove Powder, Salt and Mustard Oil. Daily brush with it for whiter and healthy teeth. 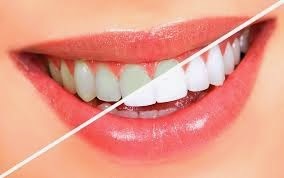 Or Using a little salt on your toothbrush while brushing your teeth will help in whitening them. Make sure you do not swallow the salt though. Wood ash or coal ash does help in teeth whitening. Wood ash has potassium hydroxide as its component which helps in bleaching the teeth, whereas the minute crystal like particles scrapes off the plague. You can top your toothpaste with wood ash and brush it, or amalgamate it with your toothpaste and brush your teeth. Make a powder of Almond Peel Off and mix Mint leaves powder in it than add salt in it. Use it daily. This remedy is very useful for white teeth form older times. Make powder with dried Orange Peel Off and mix Olive oil in it. Rub your teeth with this paste daily. Vitamin C in and Vitamin E in it keep your teeth whiter and sparkling. Mix 3-4 Pinch of Baking Soda in 1 teaspoon of Black tea hot water. Apply it on your teeth and leave for 3-4 minutes. It will remove plaque and tartar from your teeth. Mix Baking soda in Hydrogen Peroxide and made a paste. Brush your teeth with it and wash your mouth after 2-3 minutes. Very much effective teeth whitener. Oil pulling is a very effective remedy to enhance oral health and cleanse the body. The process is actually quite simple, harmless, and very inexpensive. Simply take one tablespoon of a pure, organic oil and swish it around in your mouth for 15-20 minutes. Move the oil around your mouth through sipping, sucking, and essentially pulling through your teeth. After rinsing, spit out the oil, thoroughly rinse your mouth out with water, and consume 2-3 glasses of water (purified if possible).